Lifelong Seattle resident, proud uncle, believer, Patches Pal, wanderlust spirit, kind and caring heart, baseball enthusiast, and friend to many. Survived by his mom, Virginia of Seattle and the sisters he adored, Andrea (Jim) of Seattle and Dana (Ted) of Camano Island. His nephews Edward Ryan, Liam, Dylan, Luka and niece Ashlyn also survive. Phil will also be missed by his beloved Jen and her son Tyler as well as cousins, aunts, an uncle and brother-in-law. Predeceased by his sister, Leslie and his dad, Bob. “If anyone asks you where I’ve gone. Oh, don’t say where I am. Just say you saw me and I’m doin’ fine. Philip’s Leaf is placed by Ballard Commons Park. If you have photos or memories of Philip, please leave a comment. 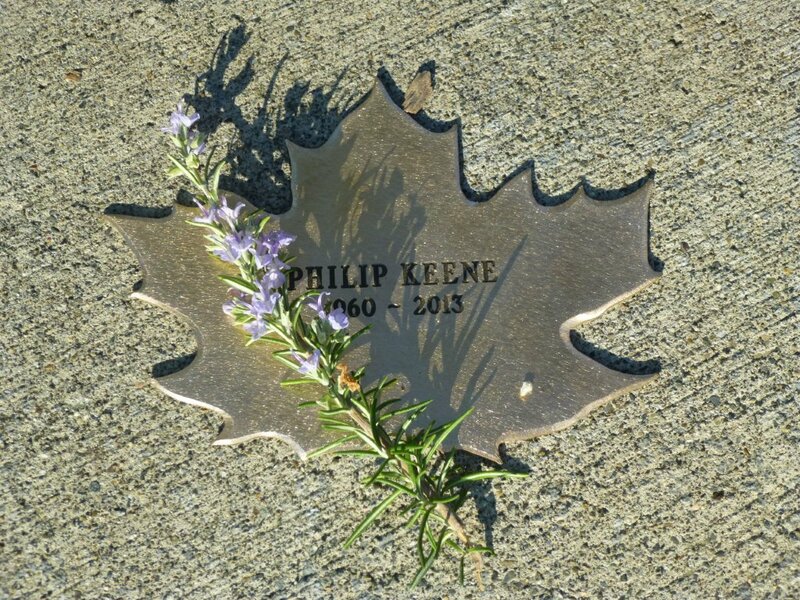 Thank you so much for honoring my brother Phil with a Leaf of Remembrance. He is missed every day. We can only hope that his story and passing will, in some way, help another person struggling with addiction and mental illness. Phil was fortunate to have a home he cherished with his girlfriend prior to his passing. Unfortunately, his disease took him back to the streets the final week before he died. It has been difficult knowing he died alone. During his years of on and off homelessness, Phil traveled all over the country and made friends where ever he went. I hope, in honor of Phil, we all can take time to smile at a stranger. Thank you for including my family in this very special project. Leslie and I shared siblings in the same grade. While Robin, my sister, did not know Phil well at all, she only had good things to say about him. I know my very dear Leslie loved him, as she did all her siblings, and she was not shy about it. I am aware that I did not know any of you well, but I did know you through Leslie’s love for all of you. These many years later have not decreased my love for Leslie, nor have the feelings at her passing. I am confident in my faith, and that Leslie and Phil have reconnected. My belief in God and His plans were the only thing that brought my through my grief at her loss. May God bless all of you now and forever. When I remember Phil I think of a person who loved his family, he cherished his sisters, mother, and especially his nephews and niece. Phil was an unassuming soul, who was always impeccably dressed. He struggled to find happiness through the many years I knew him – I hope now as he is rejoined with his sister Leslie he will find the peace that was so illusive to him. May God Bless Phil’s family along with his girlfriend’s family now and forever. May they feel Phil’s love each and every day. Smile,welcoming and warm. Voice, soft and sincere. His love,unconditional and unending. Phil much like his grandfather and father was an amazing man. He would stop by just to say hello,maybe share a smoke or take one for later. Always had time to drink a cup of coffee with me.Gave my kids the same love he gave his nephews and niece. All though his disease took him way to soon,I believe that where he travels now it is no longer a dark path but one that lifts him up and gives him peace. You might be gone Phil in the sense we can’t see you but I believe you are here in all of our lives because you left a part of you will us all. I knew Phil many years ago, in the eighties, when I first moved to Seattle. He literally took me in from the cold, offering a place to live in a house he was renting. He was capable of great generosity and kindness. Farewell, old buddy. Time and space may have separated us but I know your spirit remains among us. My heartfelt sympathy to his survivors.